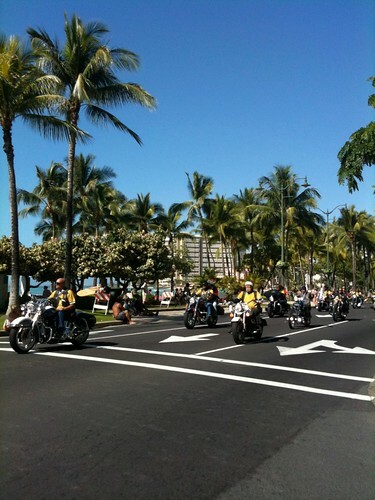 Harley Davidson motorcycles will roar in Honolulu, Hawaii and along Waikiki Beach on Sunday December 5, 2010. This is date of the 36th annual Toys for Tots Motorcycle Ride sponsored by Street Bikers United Hawaii. The motorcycle toy run benefits United States Marine Corps’ Toys For Tots program. According to Ray Pagan, State Treasurer for Street Bikers United Hawaii, the event draws participants from Honolulu and parts of Oahu as well as other Hawaiian islands, mainlanders and even motorcycle riders from other countries. The ride begins in Honolulu at Magic Island, rides though Waikiki along Kalakaua Avenue beside the blue water of Waikiki Beach, ending at Kapiolani Community College where the toys are loaded into awaiting trucks. Spectators line the route cheering the bikers who ride in a variety of outfits. Some wear their club colors and leathers while others dress more seasonally in t-shirts and shorts. Last year we saw Mrs. Claus, the Grinch and an elf riding in the parade. I even saw Santa riding a Harley Davidson motorcycle. These rider donate 10,000 toys to brighten the holidays for keiki. 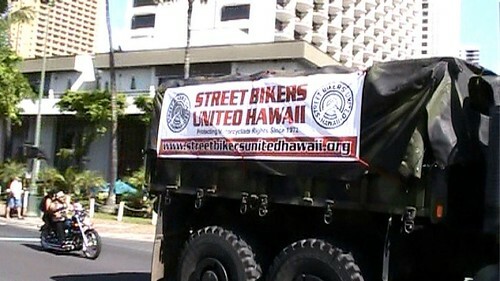 Click on the picture below to watch video of the 2009 35th annual Toys for Tots Motorcycle Ride sponsored by Street Bikers United Hawaii. Notice how quiet Waikiki Beach, Honolulu is at the start of the video and how loud things get when thousands of bikes take over Kalakaua Avenue. If you plan to be in Honolulu and ride a motorcycle, come on down for the Toys for Tots parade and bring a new toy. If you do not ride, check out the parade and cheer on these riders who are supporting the United States Marine Corps’ Toys For Tots program and making the holidays brighter for tots. Contact Ray Pagan from Street Bikers United Hawaii for more information or find out if your city is hosting a Toys for Tots Motorcycles Biker Event. 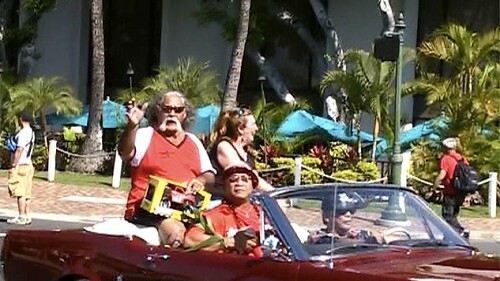 ** See video of the 2010 Honolulu Toys for Tots Parade.